The original version of this article, by Matthew Berger, appeared on The Interdependent. Last summer, after walking for days to a refugee camp across the South Sudan border, some Sudanese refugees reportedly chose to dig holes to reach muddy water rather than face the fist-fights breaking out around a failing tap. Boreholes dug by aid agencies collapsed in the crumbling soil. Even the coming rainy season brought more challenges than relief, washing out roads used by water tanker trucks and threatening the camp with flooding. Although an extreme example, the desperation and fighting at Jamam refugee camp are expected to become increasingly common as climate change, environmental degradation, and a booming population put greater strain on water resources globally. 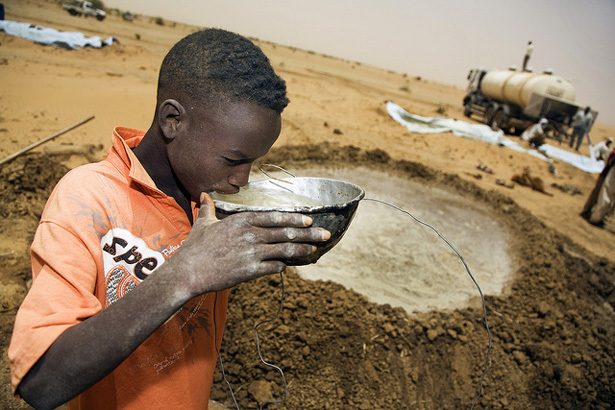 In the face of these water crises, the United Nations, NGOs, and governments are sounding the alarm that water is no longer simply a humanitarian or environmental concern; it is a dire security matter as well. This emerging focus on water security extends far beyond having enough drinking water. Water can be both a source of nourishment and of destruction, which means getting a handle on what exactly a water-secure world would look like is challenging. To that end, UN-Water, the United Nations’ coordinating mechanism for all water-related issues, recently defined the term. Continue reading on The Interdependent. Photo Credit: “UN Helps Build School for Former Child Soldiers in Darfur,” courtesy of Albert Gonzalez Farran/UN Photo.